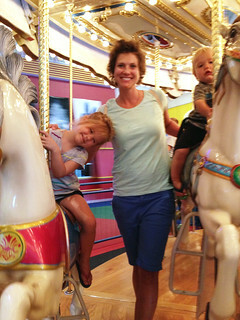 Ila, Jill and Harvey on the merry-go-round at Hollywood Connection. 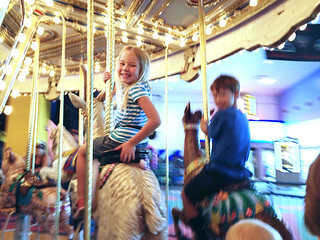 One fun afternoon we went with our friends, Jill, Drake, Ila and Harvey to Hollywood Connection. H.C. is one of those places with dizzying rides that spin you up, down, in, out, and around. Once you’re done at one ride, you run to the next for pretty much the same thing. It is AWESOME. Of course, the afternoon that we went their air conditioning was out. (Remember, this is the hottest July on record!) The kids never seemed to notice as they ran from one ride to the next. Jill and I would sit and chat, then ride a ride with the very littles, and then sit and chat, then ride another. A great way to spend a day!